Horror fans are well accustomed to growing frustrated at the moronic actions of the characters who populate their favourite genre, who so often seem to make the decision most likely to lead to their bloody demise, as if just to aggravate us. It's one of the reason's John Carpenter's The Thing is so respected, as it's a movie populated by highly intelligent people who appear to act sensibly, yet can't escape their fate. 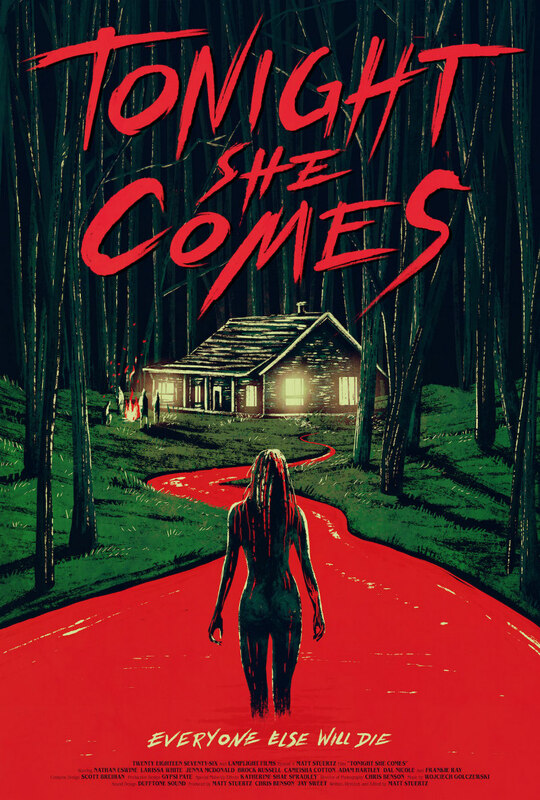 In writer-director Matt Stuertz's sophomore effort, Tonight She Comes, his characters don't so much behave moronically as ambivalently, as though they're somehow immune to the crazy and downright weird scenarios that envelop them. If you told me Stuertz plied his cast with LSD and simply recorded their improvised reactions, I'd believe you. 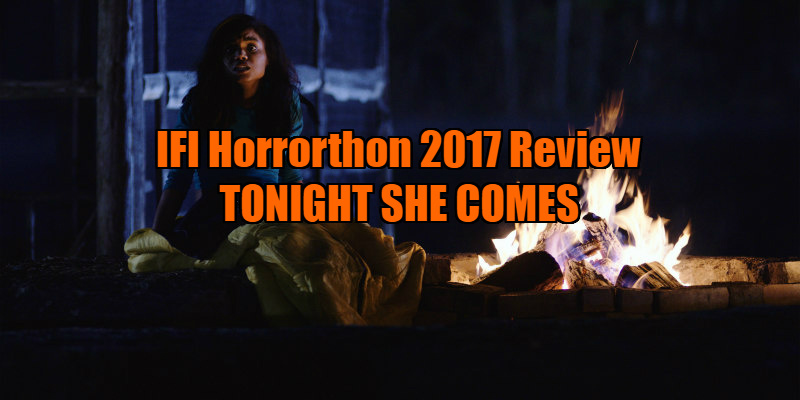 Tonight She Comes opens with a scene designed to immediately shock, as a seemingly pregnant young woman, Kirsty (Dal Nicole), appears to perform a self-service abortion. The following morning, Kirsty's bimbo pals Ashley (Larissa White) and Lyndsey (Cameisha Cotton) arrive at Kirsty's remote family home, at which point both actresses immediately fulfil their contractual obligation to strip down to bikinis. Also arriving at Kirsty's place is James (Nathan Eswine), a freelance postman (is that really a thing in the US?) whose attempt to deliver a letter to the household is scuppered when an unseen presence appears to knock him out (a plot point never investigated once the girls wake him up). Meanwhile, James' irritating stoner buddy Pete (Adam Hartley) has wandered off into the nearby woods with the aim of knocking out a quick hand shandy. Stumbling across the naked corpse of Kirtsy, pervy Pete takes a few pics on his phone before leaning in for a kiss, at which point Kirsty comes back to life! What follows is a series of baffling scenes in which the protagonists fail to realise the severity of the situation they've found themselves in, and the actors playing them appear confounded by the nonsensical script. The arrival of a naked Kirsty, covered in blood, doesn't seem to bother James, Ashley and Lyndsey in the slightest. I guess the girls have the excuse of being blind drunk, but how do you account for James, whose first reaction is to bemoan the fact that he doesn't have his phone with him and can't take a pic of the nekkid chick in front of him??? In the final act, with the emergence of a clan of stereotypical rednecks, Tonight She Comes devolves into grossout comedy antics, the lowlight coming when a character is forced to swallow a used tampon! I got the impression Stuertz was attempting to make some sort of faux-feminist point about the male fear of menstrual blood - sorry ladies, I'm all for equality, but knocking back a pint of crimson wave is a step too far. Stuertz seems so smugly obsessed with shocking his audience (the movie opens with a written admonition to play the movie 'loud...as hell') that he completely forgets the premise he set up, and no explanation is ever given for the supernatural events we witness throughout the tiresome narrative. A final jump scare proves a final insult, leaving viewers with more questions than answers. But frankly, I can live without having these questions answered.